I love movies. I love movies that I can watch while I’m knitting. Obviously, this leaves out most subtitles, so unless it’s a French flick (which I can still understand, for the most part), most Foreign Films are off the menu. What I love love love, though, are those go-to movies that I’ve seen zillions of times. The ones that you’ll find in the bargain bin, but always seem to have a copy of in almost every format out there, whether it’s VHS, DVD, or BluRay. For the record, we don’t have anything that plays BluRay. We’re not that technologically advanced! I would like, if I may, to draw your attention to one of my favourite knitting time-waster movies, Tremors. It’s a classic of Science Fiction Cheese, and I absolutely love it. I love it to the point that I bought the box set with all the other movies (none of which I’ve had the patience to sit through because none of the rest have Kevin Bacon. Sorry, but there it is. The Baconator is an integral part of the fun). 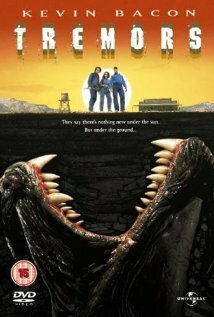 Tremors has a mixed cast of stars and unrecognizables, most notably the aforementioned Kevin Bacon, Michael Gross, Reba McEntire, and Fred Ward. The movie is set on the backdrop of an isolated desert community that includes the essentials: The shop owner, the survivalist “gun nut” couple, the doctor and his wife, the “landlord” and his entitled kid, the “isolationist desert artist” and her kid, and a variety of farmers and local culture. Add to this a geology student in the area to study for a semester, and the two guys who keep the town ticking by doing all the odd-job handyman work, and you have a winning formula for science fiction-horror satire.